The Holt Pond Preserve was established in 1970 when LEA purchased 30 acres of woodland and stream next to Holt Pond in Bridgton. Over the years, through the dedicated efforts of many, the preserve has grown to include over 400 acres. A trip to Holt Pond is always a wonderful experience. Starting at the parking area off Grist Mill Road, the path takes you through a mixed forest of birch, beech, hemlock, and pine. You cross over a stone wall into a red maple swamp. In the spring, listen for the sounds of returning neo-tropical migrant birds and in the winter, look for the flitting silhouettes of chickadees shivering for warmth. Leaving the red maple swamp you find yourself on one of the several hummocks in the preserve, a nutrient-rich glacial deposit where hemlocks have taken root. Venturing out to the Muddy River, a ripple in the water and a loud splash indicates the presence of a territorial beaver. Returning to the trail, you eventually make your way to the place where plants eat insects, moose wallow in the muddy waters, and minks scurry about looking for fish: the Holt Pond Overlook. The Holt Pond Overlook Boardwalk crosses over a quaking mat of sphagnum moss. If you bend your knees twice, you will see a slight quaking motion at the end of the boardwalk. This is because the sphagnum moss is floating, colonizing the open water in front of you. The quaking bog is home to pitcher plants, orchids, leatherleaf, swamp rose, and many other unique plants, as it is one of the most diverse natural communities at Holt Pond. Pause at the end of the boardwalk and appreciate the beauty of this spot in every season, when migrant ducks swim about, water lilies dot the surface, reflected red, yellow, orange, and brown leaves shine in the depths, or snow and ice insulate the vibrant life underneath. Download the comprehensive Field Guide and Interpretive Trail here! A wonderful companion for your walk! 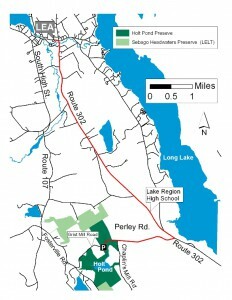 From Bridgton: Take Route 302 East; 1 mile past Lake Region High School, turn right on Perley Road. Follow directions from Perley Road below. From Naples: Route 302 West; 2.5 miles from Naples Causeway, turn left on Perley Road. Follow directions from Perley Road below. 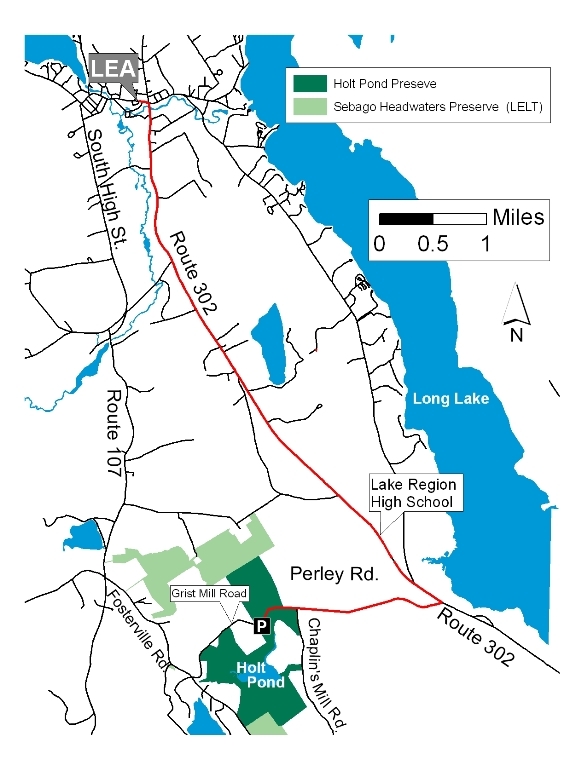 From Perley Road: 1.5 miles on Perley Road to the intersection of Chaplin Mill and Grist Mill Roads; Chaplin Mill (paved) takes a sharp (90 degree) left turn and Grist Mill (dirt) will go straight. Caution: Grist Mill Road is often unmarked and bumpy and may not be suitable for low cars. Proceed slowly! Go straight for .3 miles on Grist Mill, and turn left into the Holt Pond parking area. Hooray! You made it! The Holt Pond Preserve was created to educate people about the importance of wetlands and how they help protect water quality. 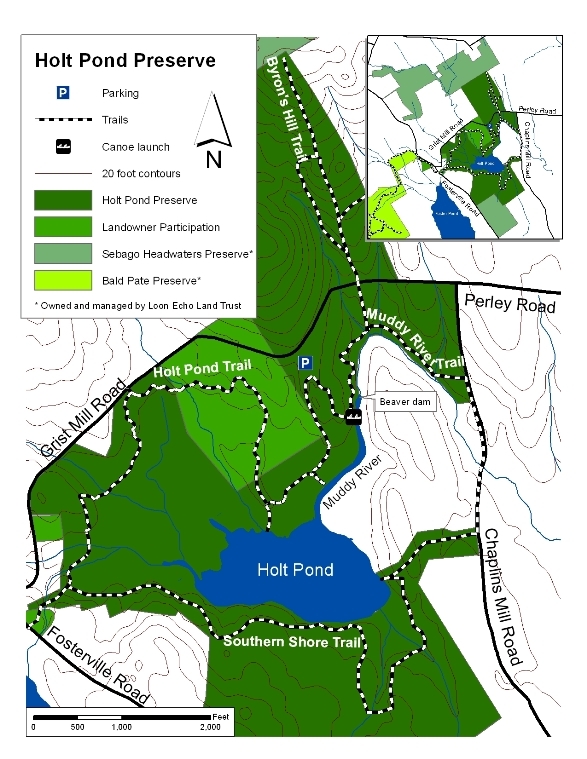 However, Holt Pond is first and foremost a nature preserve and LEA has created use guidelines to ensure that the natural beauty and quality of the area is protected. Take only memories, leave only footprints. Please do not remove any natural objects from the preserve and remember to carry out everything you bring in. No dogs. Holt Pond is home to many wild animals. Wild animals do not like dogs. To protect habitat, leave your dog at home. Please respect others’ use of the preserve by remaining quiet. Loud noises also scare animals away. Remember to turn off your cell phone! 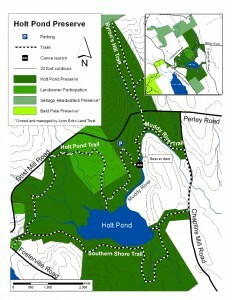 Organized groups such as camps, recreation programs, and large families are requested to make a reservation with LEA prior to visiting Holt Pond. 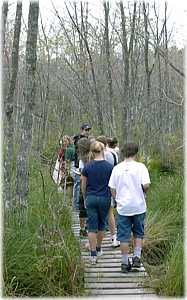 Please note, the Sebago Headwaters and Bald Pate Mountain Preserves are owned and managed by Loon Echo Land Trust. Thank you for respecting these guidelines and enjoy your visit!